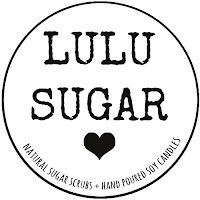 Burning Moon's Inside advice: Lulu Sugar Review! I am a typical girl when it comes to bath products, I have a ton of different products yet I am always on the look for more. I've been on the hunt for a good scrub/exfoliating scrub, half of the products I've tried don't have a scrub aspect to them at all so I have been keeping my eyes open for something else. 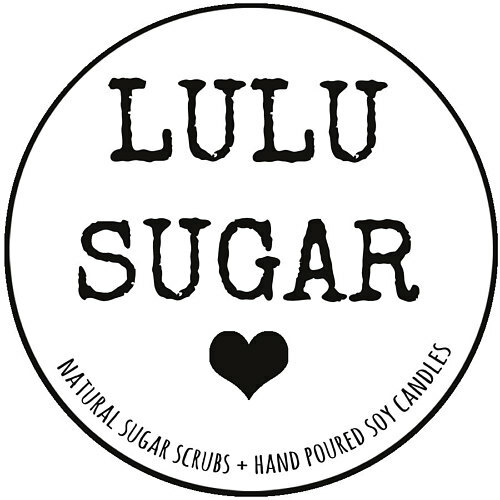 During my search I came upon Lulu Sugar which is a neat little shop on Etsy that sells a wide range of natural sugar scrubs and soy candles. For my review I received a gift set that contained one 8oz candle and a 8oz sugar scrub, I did not pick out a scent prior so it was going to be a surprise once it arrived. Shipping was quick and I was pleased with how everything was packed both shipping wise and aesthetic wise, the boxes they arrived in are appealing to the eye and ready for gifting. As you can see from the image above I received a Coconut + Lime candle and a White Tea + Ginger sugar scrub. Coconut + Lime Candle - When I opened the box I found a small branded pack of matches which is quite helpful because I can't always locate a lighter to light my candles. This candle makes me want to sing that coconut song, "she put the lime in the coconut" because of the name and the scent of the candle. The scent is refreshing and airy, there isn't an overwhelming amount of either scent the mix is just right and makes the room smell lovely. Some candles can be a pain to light because it seems like the wick takes forever to actually catch fire but I didn't find any issues lighting this which was nice, and the wax burned slowly which will give the candle a longer lifetime. White Tea + Ginger Scrub - I've actually never tried any ginger scented products in the past and I can't recall ever smelling a product that had the ingredient in it so I was intrigued in how it smelled. The smell is exotic, and has a bit of a earthy floral scent to it which was surprising but it smells fantastic. I personally really like this scrub because it doesn't fall apart right away or melt away quickly when being used instead it does as intended and helps exfoliate your skin. The jar came with a small wooden scraper which I am thankful for because after the first use it developed a lump or two in the scrub that was easy to break up with the scrapper. I am very happy with both of these products, combined they made for a relaxing and fragrant bubble bath. Instead of being in plastic containers like a lot of bath products tend to be in both of these products are in a glass jar with a secure metal lid which is awesome because they can be re-used when they are empty. You can purchase your own set for $38 plus shipping, they offer dozens of scents so you are sure to find something you'll like. While both these products look great, it would be lovely to try coconut and lime candle. Very unusual combination and looks neat too. Looks so good, almost edible. Thank you sharing your review, your honest opinion. I’m a bit curious with the white tea + ginger I think it’s nice. I've never heard of this brand but I love the packaging. It's beautiful! Both of those fragrance combinations sound wonderful, and I agree, the reusable glass containers are much better than plastic. Thanks for sharing, I'll have to head over to Etsy and check out this shop! It's great to see that the brand uses glass bottles instead of plastics. Your honest review surely will help others. Really? It does all of these things? Now I am curious, how does that ginger smell?! I am not a fan of ginger, would have to smell it first. lol. Btw, I know that song, Put the lime in the coconut! How cool is that! I love a good product review! Great point regarding plastic packaging as I like to reuse my containers- glass is best! Thanks for the post! Great review. Thanks for this information. Never heared of this combination, nice to know that these products are packed in glass bottles instead of plastic bottles. I love sugar scrubs and scented candles. I think am really enjoying the adulating stage that I always welcomes scented and therapeutic candles as gifts. Thanks for sharing your review!